Alia Tyner, a graduate of Central Park East Secondary School, has written a book about the schools history, practices etc based on her dissertation at NYU. 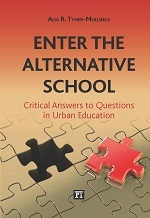 The book, called Enter the Alternative School, is published by Paradigm. It was released a couple of weeks ago and appears to be at least available from Amazon, Barnes and Noble and from the publisher. Its only in hardcover right now and, as an academic book, its kind of expensive. The cheapest option seems seems to be Barnes and Noble or the “other options” on Amazon. As an alternative educator, I would love a copy of this. Hi Deborah, I am and have long been a fan of yours. I also happen to be the principal of an alternative K-8 program in the Cupertino Union School District. I was excited to read something new and looked up this on Amazon. Why on earth is this book selling for $116 (down from the original $140)??? That’s just a bit over 50¢/page. Reign of Error is $15.09 at Amazon. You’re looking at the fate of small publishers struggling against mass market. Why isn’t there an educator’s discount for the e-book? Thanx, at $108 a pop I’ll wait for it to come out in paperback! As someone in academia, I can tell you this is actually typical pricing of this type of academic book. Their market is really academic libraries and very limited printings. It does discourage sales to the general public though.